Combine sugar and cinnamon in small bowl and mix until combined. Spread half of each tortilla with 1/2 a tablespoon of softened cream cheese and sprinkle each one with about a teaspoon of cinnamon sugar. Melt a 1/2 tablespoon of butter in a medium skillet and lay a tortilla in the pan. On the cinnamon sugar half of the tortilla, place about 4-5 slices of apple and sprinkle with 1/4 cup of cheddar cheese. Fold the tortilla in half and cook until golden on both sides. Cut into wedges. Is it really already time to start getting our brains back in school gear? I feel like the summer flew by this year and as the last days of freedom wind down for the kids (and parents), my mind has already started thinking of hearty after school snacks for my family. 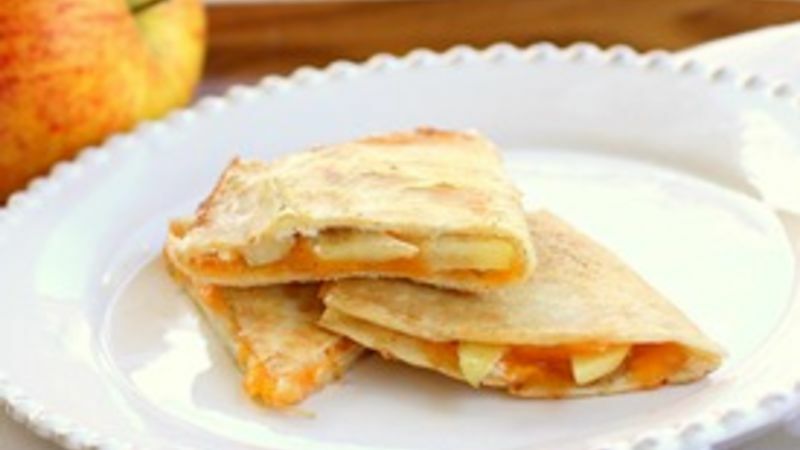 These Apple Cheddar Quesadillas are the perfect finger food to satisfy those hungry mouths. As I started to make these Apple Cheddar Quesadillas I discovered there was actually a similar quesadilla recipe already on Tablespoon that only received three stars. So why not revamp the recipe and give it a little boost? With a couple of changes and some gooey additions, this recipe is now full of flavor and definitely a winner. Just ask me … I ate four of them. Even with the changes, the recipe is still simple enough to whip up as a snack for after school or just for the heck of it. Apples, cheddar, cream cheese and cinnamon sugar are folded into a warm butter quesadilla and cooked until melted and gooey. The crispy quesadillas filled with sweet apples and gooey cheese are the perfect snack for these precious last days of summer or for the school days ahead.